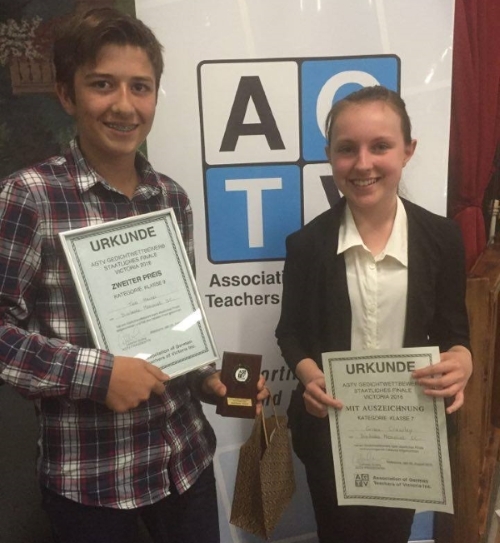 On Saturday 20th August, Teo Haines and Grace Crawley travelled to the Austrian Club in Heidelberg to recite the German poems that had gained them both first place at the Wimmera level of competition. We were thrilled to learn that Teo had gained second place in the Year 9 section of German as a foreign language. Teo narrowly missed out on a top three placing last year, so it was very satisfying for him to go two placings better this year. Although Grace did not finish in the top three placings, she was thrilled to have the experience of competing at such a high level and is looking forward to next yearâ€™s competition in the hope that she too can improve on her performance. Below: Teo and Grace with their certificates and Teoâ€™s trophy.